There is a small supermarket, at which you can buy vegetables and meats. But, no fish. A liquor shop is in front of the post office. 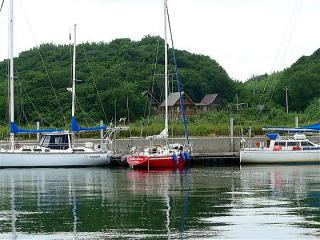 which is the old port closer to the center of the island. No water tap. People here is kind and generous hearted. 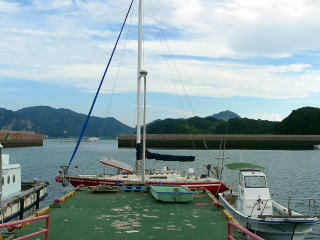 The New Port (or East Port) is located at the east side of Shiraishi-jima island. When you approach from the east, you will see the brick-red breakwater running from north to south. The port entrance is open to the south at the south end of the breakwater. 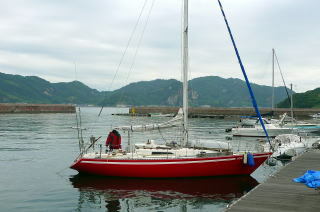 But, do not approach the port from the south, because there is danger of going aground. You should approach from the east. which is the south end, or the left end when you approach from the east, of the breakwater. When you reach the port entrance between the breakwaters, turn your boat right to the north direction to enter. 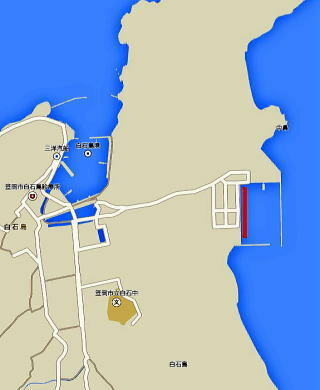 In the port, you may moor at the 150 meter long pontoon (red line in the map below) located at the west side of the port. The bow-to is the basic though, you may sometimes moor alongside as you see in the picture below. No water, no toilet or no shower. Toilet can be used at a building of B&G Foundation located beyond the hill. The port is just for local commercial fishing boats. Then, there is no facility or services for pleasure boats coming from outside.